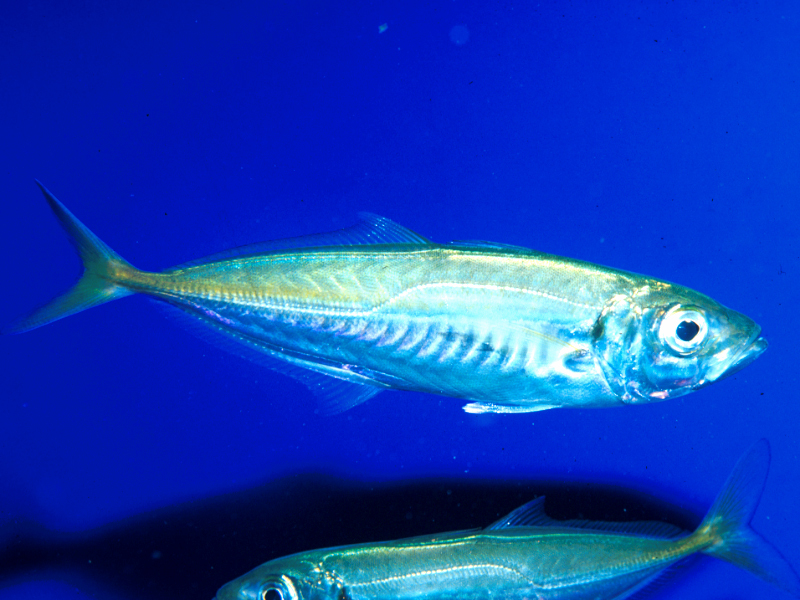 The atlantic horse mackerel is a fish with the dorsal part of its body darker than the venteal side, which is practically white. The eyes and mouth are large in comparison with the size of its body. The line that runs down the body from the head to the tail, the side line, is highly marked and presents a highly characteristic curve at the beginning. Its maximum size is 60 cm. Atlantic horse mackerels are fish that swim in schools, sometimes large, at depths of 10 to 100 m, generally on the high seas. The adults feed on small schools of fish (herrings, sardines, etc. ), crustaceans and cephalopods. The young feed on tiny larvae and crustaceans in the plankton; therefore it is a carnivorous animal. Its reproduction is oviparous and spawning (egg laying) takes place in the summer. In the summer months they are common near the coast, but in winter they emigrate to deep waters, sometimes below 500 m. They are particularly common in sandy, shallow areas. It is found in the Mediterranean Sea, the Black Sea and the African Atlantic. The atlantic horse mackerel has a small needle on the first dorsal fin that it can use to inject poison and cause painful pricks. Its side line is S-shaped.